I've got a pal who has to be his grandkids's absolute best Poppa, as Tony is constantly coming up with new ideas to keep the little guys busy and happy when they visit with Poppa & Gramma. His garage is full of home made soap box cars, all ready for the next derby, his back yard has every type of bird feeder imaginable, and there's some pretty rough looking bird houses on the fence, that look a bit out of place until you realize that they were "built" by a 5 year old & his Poppa. You should see what his house looks like come Halloween! Recently we were invited to spend a day with Tony when he was on holiday. He and his wife had the motor home parked on a pad in an RV camp at a scenic lake not far away, and were planning on staying most of the summer. Now Tony's kids are just a short drive away and often come out for a couple of days with the grand parents & the little guys always know they'll be kept busy with Poppa's latest gadget or project. The weekend we visited was no exception. The kid's were busy, busy, busy! Tony had spent a good hour or so burying coins and little metal objects, such as small Tonka type toys, cars, trucks etc, into just about everything in sight of his RV pad. The flower beds had treasures, around tree trunks, under the RV deck, on the roadside, everywhere. I bet he'd buried $20 worth of coins alone, let alone the toys from the Walmart trip the day before. 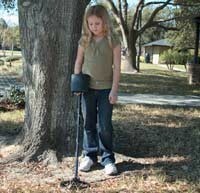 Now on that Walmart trip he'd also purchased a couple of Bounty Hunter BHJS Junior Metal Detector machines and was just dying to have the kids turn up and try their hand at metal detecting. Everything Tony does with the kids has a learning lesson attached. In this case he figured finding all the buried treasures would instill some patience and "stickability" in the little ones, as I can guarantee that if they slacked off & gave up they'd be no treasures, as I know full well that Tony'd rather waste the coins, and leave them buried, than allow the kids to give up and have him take over. No way, Jose I can hear him saying. It really was a ton of fun watching the 5 and 7 year olds learning how to operate their detectors, and even more fun seeing the delight on Poppa Tony's face as he guided them around the park, suggesting places that he "had a feeling" might yield some buried coins. Everytime one tired and wanted to give up, there was a gentle reminder on how you never achieve anything by giving up, and they were coaxed to stick with it. No wonder he's the favorite Poppa!